[Jesus said,] "I am leaving you with a gift — peace of mind and heart. And the peace I give is a gift the world cannot give. So don't be troubled or afraid. Remember what I told you: I am going away, but I will come back to you again. If you really loved me, you would be happy that I am going to the Father, who is greater than I am." The Holy Spirit, our Comforter and Counselor, will bring us peace. This peace is not an absence of difficulties, an end to all strife, or the cessation of all disagreements. We know that those problems will not disappear in our fallen world as we know it now. 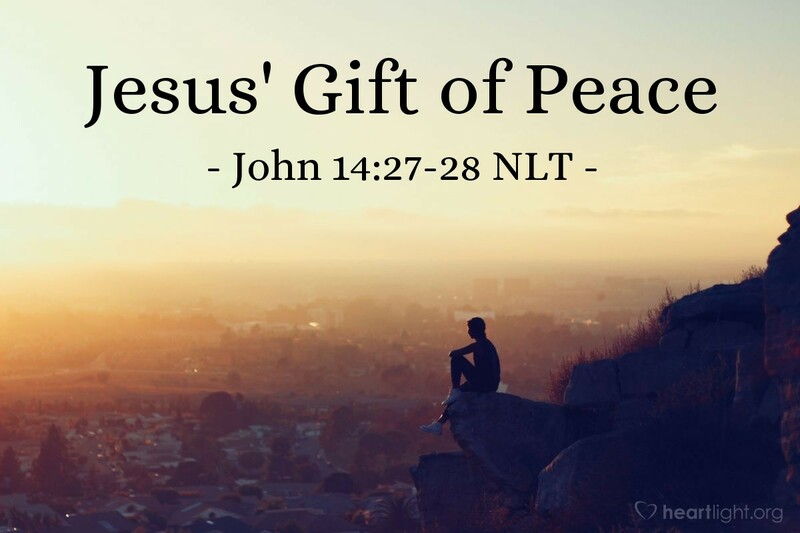 However, the gift of God's presence, the gift of Jesus' guidance, and the blessing of the Holy Spirit mean that we can have peace in our storms, struggles, and fallen world. God is present within us to guide, strengthen, comfort, lead, inspire, motivate, bless, and ... We are not alone as we face every challenge of life because God is not only with us, but he is within us! Jesus' return to heaven is not a loss of peace or his abandonment of us. It is his going away so that he can send us the gift of the Holy Spirit, who brings us God's peace. Holy God, give me a deeper appreciation of your abiding presence within me. Lead me by your Spirit to know you more completely. Inspire me by your Spirit to do your work more joyously. Enlighten me by your Spirit to make better decisions each day. Thank you, Jesus, for sending the Holy Spirit to me as your gift of grace, presence, and peace. I pray in your name, dear Savior. Amen.